Building maintenance is a necessity to make sure that your public commercial property is always up to scratch. General wear, tear, and time itself can lead to serious problems down the track if they are not identified and fixed early on. On top of this, deterioration of the building can impact its overall value, meaning that you could be missing out on fulfilling the full amount of your most important asset. KONNSTRUCT has helped many people around Melbourne just like you to keep their commercial or residential property in perfect condition. 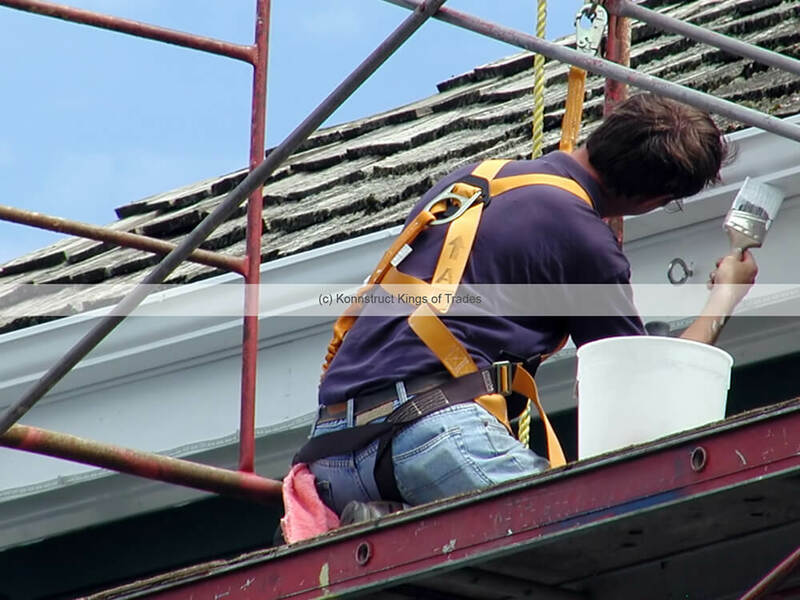 We can either make full scale repairs to drywall and general interior upkeep, or smaller details such as a new coat of paint to keep the exterior looking fresh and inviting. We specialise in offering a seamless solution for building maintenance, and can complete any job quickly, and with minimal disruption to your routine. One of the most common problems that buildings throughout Melbourne do face over time is worn or damaged drywall. Drywall that is well past its use-by-date can affect other areas around it, the paint and primer that’s used over it, and even in some cases just break away and fall off completely. On top of this, damaged drywall can affect the building’s insulation quality, leading to a less comfortable atmosphere within. Our drywall replacement and plastering repair techniques go right to the heart of the structural integrity of the walls themselves. We use the highest quality of plasterboard for all of our works, which will provide you with both a long lasting result, as well as restoring the insulation quality of the room. We can also improve the aesthetics of the walls themselves with our work, making the interior looking just as good as new by the time we’re done. The traditional weather elements of Melbourne will definitely take a toll on your exterior paint job. Which is why it’s good to know that, when it’s time to put a new coat onto your property, the team of professional painters at KONNSTRUCT are just a phone call away. Using the finest, most weather resistant paints possible, we’ll be able to not only pick out the one that will give you the best result, but paint it absolutely perfect. Our exterior painting experts utilise the most professional of techniques to make sure of a perfect finish each and every time. Whether your feature wall incorporates an intricate pattern, or a simple, bold colour, our painters will be able to present in the finest style possible. We only ever use high quality interior paints for the job at hand, guaranteeing a long lasting solution for getting that feature wall section that you have always wanted. Whether it’s an office building, a home, or even a public service building like a school, we’ll be capable of restoring your property with our carefully managed building maintenance. The tradesmen at KONNSTRUCT work to any deadline, and no job is too big nor too small for us. Get in touch with us today by dialling 1300 743 734, and let’s get your most important asset looking as good as new.